You must be a member of the Madrid Belgians in the City Group to attend this activity. Would you like to join this group? Hi 'Belgians in the city'! Welcome to the first ever event of this brand new Group! Are you Belge, Belg, Zinneke or a Belgium Lover? Then this event is for you! 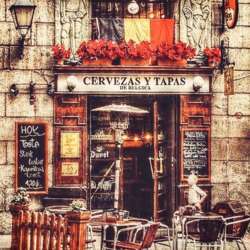 Join us in this authentic Belgian Café in the Heart of Madrid's historic city center to mix and mingle with other Belgians & expats from all over the world, while having some great Belgian beers and food! Protected content , which means pub/bar in rural Dutch, is the perfect start to discover Belgian culture or to get back in touch with it! It is located right near the plaza Mayor and has a laid-back, cosy but busy vibe. There is no entrance fee and everyone pays for their own food/drinks. Feel free to invite your international friends or colleagues to come with you! Make sure to have them registered on InterNations first so they can be on the guest list too. If you can't make it, no worries, it happens, just remember to cancel your attendance, to give somebody else the chance to attend. FYI: the guest list closes at 15.00 the day of the event.